Welcome to today’s dose of funny football news. 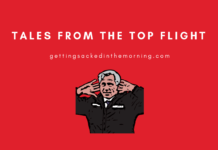 Ideally, the Premier League provides the football news and we do the funny but, frankly, sometimes we don’t even need to try that hard. For example, take Tottenham Hotspur. Yesterday, Tottenham announced that they won’t be able to play Liverpool in their new stadium on September 15th as had previously been agreed. 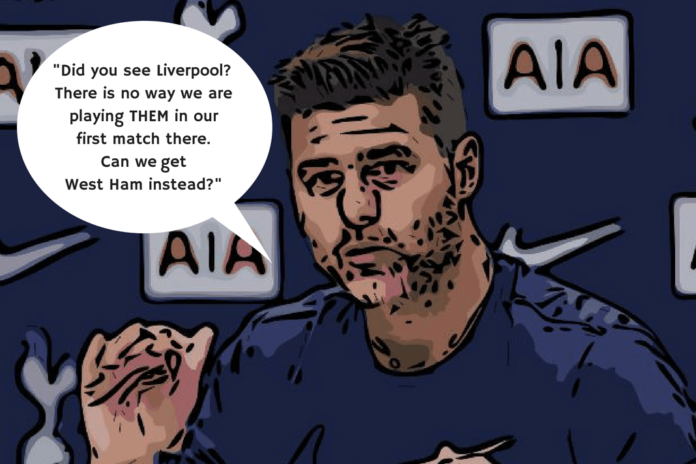 Now, cynics might think that announcement was directly linked to the fact that Liverpool looked mighty good in their 4-0 destruction of West Ham United at the weekend and Tottenham didn’t fancy getting smashed at their house party. That theory gets blown out of the water, sadly, by the news that they’ve also cancelled the game with Cardiff City too. Maybe they are just being picky about the first guests? Beating Cardiff might not be memorable enough but better than losing to Liverpool. Maybe they want to wait until the West Ham fixture or something – a nice local derby and a guaranteed three points meaning everyone will have a good time. But, safety concerns have put the brakes on Spurs playing there anytime soon. It’s not been the best couple of weeks for fans of Tottenham Hotspur FC, and then there is the news that PSG are preparing the sort of bid for Christian Eriksen that Daniel Levy would find impossible to turn down. £100m is being spoken of, but Daniel will probably turn that into £150m and the deal will be done. And, he is right. Liverpool might win something. As a result, both Simon Mignolet and Loris Karius are up for grabs and Besiktas of Turkey are interested in both of them. Or either of them. It’s not very clear and if you are going to waste money on bad goalkeepers, you may as well flip a coin. Maurizio Sarri has taken a good look at Tiemoue Bakayoko and realised that without Fabinho, who is inconveniently playing for Liverpool now, the former AS Monaco midfielder is surplus to the old requirements. He has been shipped first-class to AC Milan. Manchester United’s Marcos Rojo might have got the feeling he wasn’t really wanted at Old Trafford anymore as Jose Mourinho looked to bring in any centre-back that wasn’t Marcos or Phil Jones. He could be off to Turkey too with Fenerbahce interested in the hot-headed Argentine. Matteo Darmian is also still returning to Serie A though we don’t know where and we have been saying this for weeks. Just go, Matteo. Just go. Finally, you have to feel for Mo Salah. The guy is a footballer probably competing with Juan Mata to become the first Nobel Peace Prize-winning player and yet he is getting grief for turning down an autograph from someone that was overly harassing him. Come on folks, even Mo is allowed an hour off.